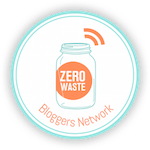 We’ve lived many different places and it is very interesting to see how different cities handle their waste. I grew up in the Portland Metro Area in the Northwest where there was a culture of recycling and bottle deposits and caring for the environment. When I moved to Florida it was a bit of culture shock to see how different things were. (I talked about Oregon so much my friends called my comparisons Oregon-isms!) Well Oregon has continued to grow in their conservation efforts. 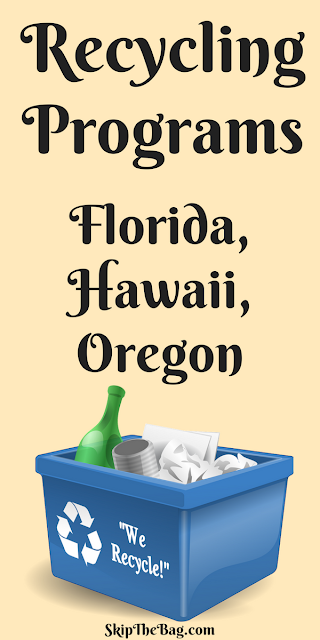 So today I’m going to share the sanitation services (garbage, recycling, yard/compost) of Kailua, Hawaii and Pensacola, Florida to those of Portland, Oregon. Kailua has weekly trash services with yard and recycling pick-up every other week. They provide gray bins for trash, blue for recycling, and green for yard waste. In the recycling container they allow numbers 1 and 2 plastics, newspaper, corrugated cardboard, paper bags, glass bottles and jars, and metal cans. They do not allow plastics numbered 3-7, magazines, other glossy paper, or cereal/cracker boxes. They yard waste is for grass and tree trimmings. The trash can is for everything else. Hawaii has a 5 cent bottle deposit on most of their beverage containers to try and encourage people to return their bottles to the store, but the others can be recycled if they meet the requirements. Pensacola has weekly sanitation services. They provide black bins for trash and brown bins for recyclable items. Yard waste is also picked up weekly, but they ask that items are placed on the side of the road (not in a bin). Items like branches are just put in a pile and they have a crane which picks up the debris and loads it into the truck. They just sent out a letter requesting that customers no longer put smaller debris like leaves or lawn clippings in plastic bags, but rather use paper or compostable bags. Portland has some major differences in their sanitation services. They have weekly recycling, composting, and glass pick up. However, they have garbage pickup only every two or four weeks. They also have different size garbage cans for you. The fee you pay for sanitation is based on the size of garbage can you have and how frequently you have it picked up. Portland allows all paper products including juice and milk cartons, shredded paper, and phone books. It accepts all plastic containers regardless of number as long as the neck is smaller than the base and it is at least 6 ounces in size. It accepts all tubs (think yogurt containers) as long as they are larger than 6 ounces. It even allows plastic buckets that are 5 gallons or smaller! They do not accept plastic bags, plastic lids, or rigid plastic containers “clamshells”. They also collect bits of scrap metal, such as lids, screws and nails in addition to items like tin foil and aerosol cans. In the yellow glass container any glass bottle or jar of any color is allowed. It does not allow for drinking glasses or broken glass. Portland also has a 5 cent bottle deposit on beverages which further encourages bottle turn in. Despite their large expansion into what items are recyclable the most novel in Portland is their use of a compost bin. The compost bin includes yard debris similar to that allowed in the other locations, but Portland also encourages its residents to dispose of food waste in the compost bin. Any meat, fish, dairy, grain, fruit or vegetable product can be disposed of in this container. Even coffee grounds and filters, pizza boxes and paper towels can be put in this bin. Things not allowed in the compost bin are pet waste/cat litter, coffee cups, plastics labeled compostable (except for approved bags), dirt, or branches over 4 inches. All other items which do not fall into the recycling, glass or compost bins would go into the trash bin. You can see how with such expansive recycling capabilities they are able to go to bimonthly trash pickup. 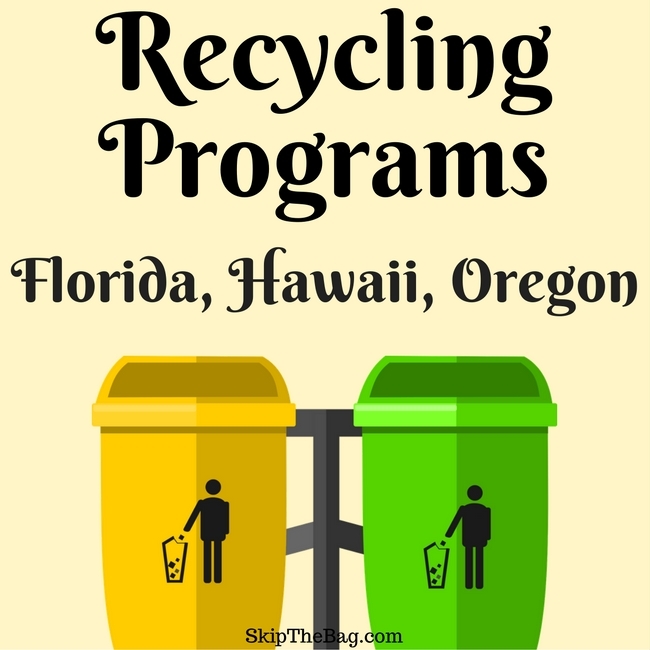 Ideally most locations would try and model their recycling programs after those in Portland. However note none of the locations allow recycling of plastic bags. The best way is to #skipthebag so you prevent its use in the first place. But most grocery and big box stores have boxes in the front which collect plastic bags to be recycled. So if you get a bag, recycle it! What is curbside recycling like where you live? Dealing with the residential dumpster rental corporation would be a great experience. I ordered a dumpster also it was delivered very quickly and inside the timeframe given. The procedure took no longer than Fifteen minutes to reserve so when scheduling a pickup, they arrange it for the following day, which exceeded my expectations! Interesting, ours is done via the city.